Turn challenges into opportunities is the motivation behind this lady from Iloilo. Ms. Noemi Viado , Teacher Ging to her wards, is mother to Sarah Gay, now 23. After knowing of her young daughter’s diagnosis, earned several units for a Master’s in Special Education at the Philippine Normal University. She also has attended numerous trainings in the field of special education both here in the country and abroad. 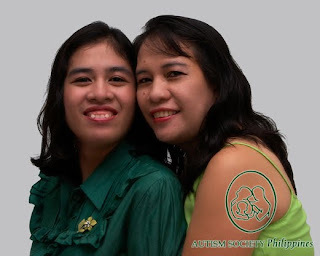 Later, she put up her own special school, GS Option House for Autism and Related Disorders, located in Biñan Laguna, hoping to extend services in nearby municipalities. Now, serving as ASP’s Trustee, she conducts lecture on autism to parents and professionals and facilitates support groups for moms with special children enrolled in her school. Don’t miss Teacher Ging as she comes to Manila to facilitate the FSG on July 24 ! Hurry! Register now. Limited seats available. Good Day Sir Edgar. FSG will be this coming July 24, Sat. 1PM. You can still call us at 926 6941 or 929 8447 to register. Thank you.